Virtual (soft) switches present in almost every hypervisor significantly reduce the performance of high-bandwidth virtual machines (measurements done by Cisco a while ago indicate you could get up to 38% more throughput if you tie VMs directly to hardware NICs), but as I argued in my “Soft Switching Might Not Scale, But We Need It” post, we need hypervisor switches to isolate the virtual machines from the vagaries of the physical NICs. Engineering gurus from Cisco and VMware have yet again proven me wrong – you can combine VMDirectPath and vMotion if you use VM-FEX. One of the challenges of designing data center networks that support cloud service is agreeing on what exactly each one of those services should be doing. 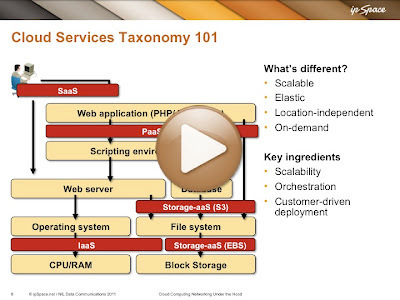 This video (part of the Cloud Computing Networking webinar) explains what various categories of cloud services actually do and where they could be used in a typical web application stack. While it might be theoretically possible to have a mixed Phase-1/Phase-2 DMVPN tunnel (and I just might be able to get it to work in a lab), such a solution definitely violates the KISS principle. A long while ago I got a very interesting e-mail from Dmitriy Samovskiy, the author of VPN-Cubed, in which he politely asked me why the networking engineers find the stretched layer-2 subnets so important. As we might get lucky and spot a few unicorns merrily dancing over stretched layer-2 rainbows while attending the Networking Tech Field Day, I decided share the e-mail contents with you (obviously after getting an OK from Dmitriy). Should you use FC, FCoE or iSCSI when deploying new gear in your existing data center? What about Greenfield deployments? What are the decision criteria? Should you just skip iSCSI and use NFS if you’re focusing on server virtualization with VMware? Does it still make sense to build separate iSCSI network? Are jumbo frames useful? We’ll try to answer all these questions and a few more in the first Data Center Virtual Symposium sponsored by Cisco Systems. 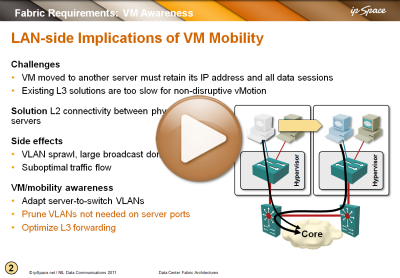 You’re probably sick and tired of me writing and talking about networking requirements for VM mobility (large VLAN segments that some people want to extend across the globe), but just in case you have to show someone a brief summary, here’s a video taken from the Data Center Fabric Architectures webinar. New webinar: Cloud Computing Networking – Will It Scale? Last December I described the technologies that could be used to implement Infrastructure-as-a-Service (IaaS) clouds in the Cloud Computing Networking: Under the Hood webinar. In the meantime, I focused on the scalability aspects of these technologies and the need for virtual/physical separation. These topics are described in a sequel to December’s webinar: Cloud Computing Networking: Will It Scale? (register here). A while ago I wrote that the hypervisor vendors should consider turning the virtual switches into PE-routers. We all know that’s never going to happen due to religious objections from everyone who thinks VLANs are the greatest thing ever invented and MP-BGP is pure evil, but there are at least two good technical reasons why putting MPLS/VPN (as we know it today) in the hypervisors might not be the best idea in very large data centers. March 2007 was clearly the “local usernames” month. I wrote about Configuring local authentication with AAA, One-time passwords on Cisco routers, Local usernames with no password and Enhanced password security for local usernames. March 2009 had a mixture of DSL and BGP topics. DSL topics included ADSL overhead and Rate-limiting inbound traffic; BGP ones AS-path prepending: technical details, BGP Local-AS feature: the basics and EBGP load balancing with a multihop EBGP session. The first question everyone asked after Nicira had published yet another MAC-over-IP tunneling draft was probably “do we really need yet another encapsulation scheme? Aren’t VXLAN or NVGRE enough?” Bruce Davie tried to answer that question in his blog post (and provided more details in another one), and I’ll try to make the answer a bit more graphical. Wim (@fracske) De Smet sent me a whole set of very good VXLAN- and EVB-related questions that might be relevant to a wider audience. If I understand you correctly, you think that VXLAN will win over EVB? I wouldn’t say they are competing directly from the technology perspective. There are two ways you can design your virtual networks: (a) smart core with simple edge (see also: voice and Frame Relay switches) or (b) smart edge with simple core (see also: Internet). EVB makes option (a) more viable, VXLAN is an early attempt at implementing option (b). In almost every field of IT lots of people try to do their job relying on uncle Google and his friends (bloggers, forum wizards and other content producers) and cut-and-paste solutions found on the web into their programs, server- or device configurations. Here’s my theory why that might be the case; please feel free to shoot it down in flames. My regular readers probably know that I’m running a 4-month course in scalable web application design at University of Ljubljana (everyone else will find more details here). I was extremely surprised when we started – I’d expected to see about a dozen students, and suddenly realized I was standing in front of a totally crowded classroom. The next amazing surprise was the students’ level of motivation, commitment, knowledge, and the quality of their questions. It’s definitely fun to have an audience like that. HP has recently released OpenFlow support on a few more switches and some people think it’s a big deal. It just might be if you’re a researcher with limited grant budget (which seems to be one of the major OpenFlow use cases today); for everyone else, it’s a meh. Lacking a commercial-grade OpenFlow controller supported by HP (or at least tested with HP switches), OpenFlow on HP switches remains a shiny new toy. As I wrote before, OpenFlow-controlled network forwarding (example: NEC, BigSwitch) experiences a totally different set of problems than OpenFlow-controlled edge (example: Nicira or XenServer vSwitch Controller). Instead of drinking beer and lab-testing vodka during the PLNOG party I enjoyed DHCPv6 discussions with Tomasz Mrugalski, the “master-of-last-resort” for the ISC’s DHCPv6 server. I mentioned my favorite DHCPv6 relay problem (relay redundancy) and while we immediately agreed I’m right (from the academic perspective), he brought up an interesting question – is this really an operational problem? As you know, I’m back in Poland, this time attending PLNOG. Meeting the wonderful team of the PLNOG organizers brought back old memories and I figured out I haven’t blogged about the Euronog videos they started publishing late last year. The last time I checked their web site only a few videos were available. Imagine my surprise when I figured out almost all the presentations they recorded are now available for download. I decided it was high time to start using some of the cloud services I'm writing about in production. Haven't jumped into EC2 yet, but the DNS server for ioshints.info has been moved to Amazon Route 53 and the static parts of the blog are served from Amazon S3. This should result in somewhat faster web site for my largest audience - US readers. Next step: CloudFront. And as always - if you find something is broken, please write a comment or contact me directly. While I was discussing the intricacies of Cisco’s IPv6 implementation with Gunter Van de Velde a while ago, he suddenly changed hats and asked me whether I would be willing to contribute to a BGP filtering best practices draft. I’m still too young to realize it’s not a good idea to say YES every time you see something interesting and immediately accepted the challenge.